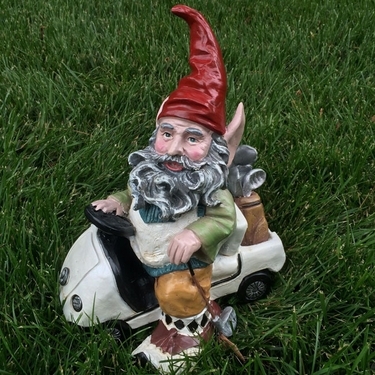 From our Premium collection, our Amazing New Golf Gnome Riding in Golf Cart is one of the nicest gnomes we've every carried. Incredible detail, this figurine is a work of art for the most discriminating gnome collector. Playing golf all day long in the garden in full sweater and golfing pants get-up with lucky clubs in the back seat and driving from hole to hole, looking great indoors or outside on the greens, a MUST for any golfing garden enthusiast!